Glenavon boss Gary Hamilton. Pic by Pacemaker. 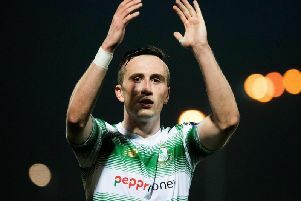 Saturday’s defeat to Cliftonville marked a fourth at Mourneview Park across 2019 - with league leaders Linfield next coming to town in a bid to cement control of the Danske Bank Premiership title charge by adding additional injury to insult. Linfield boss David Healy. Pic by Pacemaker. Hamilton has turned his focus to mental strength in search for a solution, citing the lack of high-pressure experience across his youthful squad as central to Lurgan struggles. “We have quite a few players struggling for confidence or self-belief at home, it has been an ongoing issue,” said Hamilton. “We’ve dropped too many points at home and it’s something we try to address by talking to the players but, ultimately, it comes down to each individual. “Our squad does not have that many players who have been in that environment where you must quickly adapt and find that mental strength. “The top, top players - those who stay at the peak for longer and pick up the big medals - tend to be those with that self-belief. “It’s not a question of ability and in the past our most successful squads have had people like Shane McCabe, Eddie McCallion and ‘Winkie’ Murphy, guys able to shoulder that pressure because of past experiences. “I’ve seen players struggle to handle it and fade away, that’s why I’ve so much admiration for people like Kyle Neill and Ciaran Martyn, two of the mentally strongest I know in my career. Glenavon face Linfield aiming to close the six-point gap on third-place Crusaders. “I believe we can prove competitive against Linfield and challenge for a result but know others will write us off,” said Hamilton. “In many ways, that suits as it takes the pressure off and players can just go out and perform. “Naturally players tend to lift performance levels when facing the bigger teams compared to games when they go in with the expectation of victory. Linfield boss David Healy signalled his players’ last-gasp victory over Newry City AFC as “massive” entering the trip to tackle Glenavon. The Blues sit top of the table, clear of Ballymena United by nine points but having played an extra game. “We made hard work of it but credit to the players, they kept going right to the full-time whistle,” said Healy on the Linfield website in the aftermath of Chris Casement’s injury-time goal. “Our performance wasn’t up to the standard we’d hoped or wanted but maybe it was a step too far, we’ve played a lot of big games. “But I thanked the players and I think, all-in-all, we deserved the win. “Chris Casement was captain on the night and scored a huge, huge goal for this club. “It keeps us on top, gives us another clean sheet and massive three points. “People outside are saying it’s Linfield’s (title) to lose. “You don’t get lucky with 22 clean sheets or the amount of goals we’ve scored.